KUALA LUMPUR, 20.10.10: A group of bloggers met last night to discuss the police report lodged against bloggers by a Cabinet minister and the on-going investigation by the MCMC that was initiated against two bloggers so far following that police report. They decided at the end of their meeting to set up "Bloggers for Malaysia" and vowed to make it a force to be reckoned with against parties - government or not - that resort to police reports, the MCMC, and lawsuits to intimidate bloggers. Controversial author Syed Akbar Ali, who runs OutSyed The Box, was unamimously made protem President of the BfM (same initials as everybody's favorite station BFM Radio). Syed was charged for sedition in 2008 on the same day as RPK but this charge was DNA (Dismissed Not Amounting to Acquittal). RPK was also given DNA later as he'd fled the country by that time. Tony Yew, the blogger Alliedmaster who took on Malaysia Airlines in 2007 (and lost, of course) over the infamous sacking of his pregnant stewardess wife, is the pro-tem secretary-general. The meeting took place in the conference room of the National Press Club, the same place the so-called "Band of Blogers" was formed one still night in 2007 by a group of Malay bloggers from different political backgrounds who met discreetly to plan a new media "war" against the arrogant and ignorant Abdullah Ahmad Badawi's administration. The NPC was also where some 60 socio-political bloggers of various races and political affiliation met to set up the National Alliance of Bloggers, or All-Blogs, after the shocking lawsuits against me and Jeff Ooi. With the setting up of BfM, All-Blogs will cease to be. I will be writing to the other All-Blogs' office bearers in my capacity as the interim presidenr of All-Blogs of my plan to disband it. I am confident that BfM will be able to pursue All-Blogs' objectives of promoting responsible blogging and providing a shield for bloggers. We will meet in two weeks to finalize details for registration and expect to call for a general meeting by end of the year or early 2011. In tne meantime, the protem president has issued a stinging statement regarding the latest attempt to intimidate bloggers by the authorities. Can all bloggers ( not necessarily with high hits) can join this? Time for a body to defend bloggers! To provide for unforseen cases like this RAIS thing. Sampai lama mana Pagar asyik duk kebas padi..sampai TERKILAN semua orang? Datuk, I am not a political blogger but previously I did write an entry namely 'Minister Vs Blogger'. Another group met at a hotel near Bandar Utama...to plan counter fight you all? In any case...nice to note political fearless bloggers...no easy meat for government to bully. Why is Syed Azizi owner of the "kickdefella" blog? Why not elected as one of the office bearers ? He also kina jail for upside National flag. And where is Hishammuddin Rias..welknown to be fearless too and jailed few times. Cannot rope these freedom fighters...means political bloggers not united. I read that when comes to trouble with political bloggers..all of you are strange fellas and can unite...and enemies can be friends again. So where is Zorro...who also kina jail. Get all the political bloggers that was jailed into this so call "Bloggers against Bullies". Only then you have unity and strength. Otherwise...it appears to be helping Najib with excuses...to get rid of some of his ministers? Yes siree....political bloggers are far from being united. Somehow...I have a strange feeling...Rocky is most powerful in the new group. There are machais and die hard loyalists to him. Being CEO of M.Mail...understandable not to stand for election...just as Jeff Ooi cannot bother with small futs now. Onward the braves! Down with bullies....the old decrapid bullies! Yes this will be open to all bloggers. Not Anons, though (no disrespect to you) coz Anons don't usually get into trouble unless they do a Hassan Skodeng and give themselves in to that Minister's Communications and Multimedia Commission! Hehe. That is a must. Can't expect pro-bono saja. Orang lain pun nak cari makan. You are always welcomed to join! You contributions to Bloggers United and All Blogs are still remembered, bro. Can you ask if Hisham Rais, Sheih, Zorro and the others would support this initiative? aiyoh...Rocky....To me...Zorro is worst of the lot...Sheih is still floating...dep4ending where the wind blows and Hisham Ria...wishes to be a Lone Ranger. Appreciate your kind offer and your gratitude. I belong to no political party..but support change of government. You all fight bullies...yet some are die hard UMNO B members. My mission is to free voters minds as much as I can..
No agree to disagree. It is AGAINST government of the day. Yes..Attan...we are friends and yes...love to attend one of your roudy bunch meeting again. Take care...and may your daughter be well and good...more and more....each year. Well, its good to hear of such group.But until such time, clear objectives and directions need to be addressed. Such as are those bloggers from other camps would be defended by this group? Responsible reporting? Thats the best news. It is with this formation, the general public expect more from your group of bloggers. Stop the spins,report and write on issues , controversial or otherwise,step on toes the ruling elite if need be, expose the many allege corruptions,abuse of power etc. You political bloggers must remember, your enemies are not Anwar, RPK, or LGE. Your enemies are those that allegedly that commit corruption, abuse of power etc as mentioned. They are enemies of the people, the rakyat, and i believe you bloggers has a duty to report as it as, and defend no one, be it BN or PR. Straight honest reporting will will command respect from both sides of the political divide. It has been few years we met. I like to invite you....Tony and your President for coffee and cigars....with at least two solid hours to chit chat. If you can get Patrick Teoh....of "NIAMAH" blog in..it will be fun. Pat and I are friends for more than 35 years. Yes...love to have a cigar and coffee with you. Many time..drove pass M.M. office...I wanted to drop in to say hello..but fear your guards may throw me out. Now that I know...you "remember" and is grateful...OK la. Differences we will always have...but as Malaysians..you are one hell of a great Dad..I deeply respect alot. I mean our small Rat Pack..like Frankie and his merry men. Looks more like a who's who list of Bloggers for Mahathir. Blog this Rais Yatim fella to death. Way to go. I support you personally..all the way...for what I did before..with my contribution. No asking for donations..this or that to reap millions. Gate and Guard nonsense is conning residence under the disguise to protect..which should be the job of the police. We know how many millions they can collect if successful. Problem with our useless government...they like others to do their dirty jobs. Just throw parties and auctions. Maybe you should sell your house like our beloved Tunku to give us freedom from the British...and look how ungrateful and sinful mamak is..to our Papak Malaysia. hopefully, every bloggers join this group, as bullies bukan sahaja kepada political bloggers, but to anybody , and also to me as 'crime' blogger. i will join when ur link ready. What's wrong with filing a suit against bloggers? Bloggers are humans also and sometime they go overboard and write lies. The only way to get justice is to go to court. And of course, bloggers can also go to court and sue. Ngapa BUJAI tak dilantink jadi presiden? Kalu BUJAI jadi president, depa bole beri perspektif RASI dlm ape jua masala berkaitan kementerian dgn para blogger. First Lady Summit. Apa kepala benda tu? Duit kocek dia ke atau duit rakyat? Apa faedah? Yang aku perhatikan First Ladies yang datang semua dari negara papa kedana di Africa atau negara kemelut kerana perang macam Sri Lanka. Tak tahan aku. Buat apa undi BN kalau bini buang duit macam ni? Nasrudin Hassan berkata PAS akan menganjurkan perhimpunan di masjid-masjid selepas solat Jumaat, esok bagi membantah tindakan Rosmah Mansor menghina syariat Islam. Alhamdulilah, Nasrudin teroskan perjuangan mu, menegakkan Islam dari jalang jalang. Well, samseng heads now organizing members for final assault. "Bloggers against Bullies" from the government. What about certain political bloggers....bullying commentators/visitors under the disguise...they own the blog and have the rights to moderate... delete or keep them out. Why not all of your members declare they support freedom of speeches and rights of each Malaysians...equal to all...no double standards to be supported. Will you all declare to despise double standards from UMNO B? You must give readers more details of "Bloggers against Bullies". Government may bully bloggers .....but Malaysians also know political bloggers bullies the government too. We are more interested that political bloggers are against corruptions...and racists...from a gang of robbers and thieves in UMNO B. Can you all bloggers keep exposing them? It seems...when come to corruptions...most Muslim political bloggers keep quiet. hi...they steal from all Malaysians...steal from your brothers and sisters too..not just other races. "Bloggers have no one to turn to. They just look at each others' faces without having anyone to defend them as there are no laws protecting them when they merely write or express their views on an issue they're interested in..
Jangan kata Bloggers ajer, kami rakyat biasa ALSO have no place to turn to. May Allah Bless all for coming up with this NOBLE effort. Which means he's not a bully? I'm just wondering, if I write something about you, in my blog about - say, your brother or sister be given contract to print Malay Mail newspaper because I overheard somebody mentioned about it. And I get like 100 comments condemning you, and my fellow blogger friends also overheard the same thing (but in a different version, probably your mum and dad got their hands in it too and they say your office cafeteria being operated by them) and wrote something about it too and they get, like a 100 comments cursing you, and to make it worse, nobody is publishing any proof whatsoever (award letter, ic copy etc.). I wonder, with all the things that happened, when a simple rumour (or probably a joke) spread like wildfire and became out of control , are you going to lodge a police report against me like how Rais Yatim did to you? Or are you just going to do the cleaning-up yourself by publicizing all your and your family personal assets - accounts etc, your IC, the award letter and hope me as the first person to write about you to put up a small column in my blog that says 'I was wrong' and you can hope that I don't write another side story about you on a different issue? Or... are you just going to sue everybody's asses off? I am just wondering Rocki, if you were in Rais Yatim's shoes, how would you react to such an article (The claim on the Rais' children involvement in the license award)? I am interested to be a member. Show me the links Bro. Wrote something in my blog regarding this issue. Keep up good work. Not open to anons? What to do...so we have to knock on other doors, eh? There are two powerful leaders in the country now. Yes TWO. 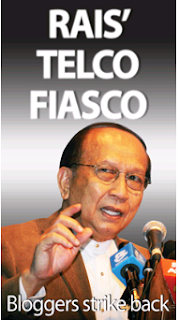 Why Rais Yatim and not TS Muhyiddin Yassin? Did you realise that Rais decided not to air Muhyiddin's speech at the opening of the Umno Youth, Puteri n Wanita LIVE on Tuesday? It was his decision not carry it live. It was his decision just to broadcast live only PM's speeches. Do you know why? It is because Rais feels that deserves to be the TPM and not Muhyiddin. That's how powerful Rais is and his wife's association with DS Rosmah is making Rais' head bigger. There is no other reason for the failure of RTM for not airing live muhyiddin's speech. In Malaysia, "Bloggers against Perkasa Bullies non-Malays". Rocky, you want to join? Hassan Skodeng offers his skills and red bulbuous arse for this, chief. How do you defend an Anonymous blogger when we don't know who he/she is in the first place? I cannot help agreeing with Rocky on his reply to nightcaller..or to an anonymous commentator. Everyone knows who "monsterball" is....and Rocky and many others have met me personally. By all means keep commenting and be faceless..nameless.....but for these commentators...do not try to be too brave or insulting others. If you want to...show your face and real name. I have been complaining to blog political owners that fell into deaf ears and even got myself moderated or massages deleted under the rules they are blog owners and can do as they like. I have been saying that only7 Rocky's blog..he will approve all comments...even insulting him. I did that many times and my messages were all approved. Previously...we F each other with the finest foul words one can think of...for fun and for serious replies too. But so many anonymous and faceless buggers keep firing back. I am glad Rocky responded few times to faceless and nameless guys/gals. Go visit few political blogs and read all the brave and faceless and nameless commentators....for or against. The government is smart to allow this...hoping readers will know.these faceless and nameless commentators do not carry any weight. For that....not true at all. You can read all comments and know...readers do learn from faceless and nameless too and for that..they do contribute alot for readers to read and learn. But so many talk nonsense too...day in day out. I talk nonsense sometimes for fun..but not day in day out. I am happy Rocky talk like that. I hope political bloggers read Rocky's replies to anon and faceless nameless creatures. Regardless they are for or against...they should not focus on blog owners or commentators...but on the message to Malaysians by ways of FOR or AGAINST change of government...no more no less. They do not also walk the talks...so why talk so bravely to insult others...like cowards with no face and name? Najib and Rais should quit ASAP. Let Tan Sri Muhyidin take over. Malaysia has confidence in Tan Sri and absolutely zero confidence on Najib, Rais. Many political bloggers practice to select and approval of comments ..are hypocrites too. Most are blogging to get attentions and be employed. I support change of government and that does not mean I support RP leaders personally. Voters must be known as all powerful. Voters are People Power..and have the obligation to his/her country and people and not for personal benefits. UMNO B is a very corrupted political party..ever since under Mahathir and on going. Remember..UMNO is dead...killed by Mahathir..to be a Dictator for 22 years. It is actually..managed by a gang of robbers and thieves and trying very hard to frighten all...and call Muslims to unite as Lords over others. UMNO B must be voted out for their arrogance...sinfulness.. applying double standards...encouraging dirtiest politics you can find in the whole world. Mahathir was the ring leader and still is...as you can see from latest general assembly of the party. We must vote them out and let PR govern. After maximum 2 terms or 8 years...and if we are not satisfied...we vote PR out again. Voters keep thinking and doing like this....then politicians will trully respect all Malaysians. It will be shameful and meaningless if voters keep supporting BN...like blockheads and racists..after more than 50 years. Remember.....the country is managed by experts employees...and not UMNO B ministers that you can see...from day one elected..they spend 90% talking politics and doing nothing at all. Millions are paid to these people by tax payers money....doing nothing but talking politics. They just sit and give final decisions to the professional employees and all must also be geared to please UMNO B members and win more votes..kind of weird and sickening rules. Right now.....PR is 100% correct in all their accusations. Let Anwar.. Nik Aziz .. Lim Kit Siang ...Kapal..Lim Guan Eng..govern the country. All Malaysians must want true unity as Malaysians and not......"I am a Malay first ..Malaysian second"...kind of nonsense. That's politicians talking to brainwash weak minds...to keep stealing with no fear .....as the rules are all set up to protect them. Internet have contributed to educate and free minds..bot bloggers or commentators. I feel sad that your former friends like Haris, Zooro, Niamah and others who regularly gathered in blog house are no longer there for you. It only shows that you can sell them once but not a second time. If your story is true, I will still support you. What I mean is those faceless bloggers. They live by their name and although their identity is not publicly known, they do stand with what they write. Yes, so-called Anons are welcomed. As long as one comment as Anons and are not faceless or nameless..known by commentators and blog owners...then they are not faceless and nameless per se. They have guts and should be recognized. Rocky should say this..not me. But since he is vauge...I need to make sure he does not support faceless and nameless cowards that talk big here...supporting UMNO B. "Anonymous" 9.48am asked where is Harris..Zorro and Patrick Teoh. One well educated.. ventured out long ago..hoping to be picked up fast..and noticed..but failed. One can sell his mother for a song. And one cannot be bothered with dirty politic as life is short and doing well in his own business. I wonder will Jeff Ooi be part join. Or will be too he embarassed to join hands with Rocky again. Also wondering is there some discrete plans here by some particular bloggers to further their covert agenda? This happened with Rocky before and can happen again. What do you say Rocky. NONSENSE...Blogger don't need a group.. ONLY politician bloggers need to.. we bloggers r united.. PLEASE FORWARD THIS COMMENT TO ANY MEDIA, BLOG, ONLINE NEWS TO CREATE AWARNESS TO THE RAKYAT. THANK YOU FOR YOUR KIND HELP. ANY POLITICIANS, from ruling govt or the oppostions the obj is get into power, collect wealth? cronies & their familys? citizens, public left behind for the rest of life? Public pays the price! To me if the government is done a good job ONLY if each & every citizens could be able at least fullfill the NEEDS (Keperluan) in economics terms is good enough, if the WANTS (Kehendak) fullfill then i can say the government is done a excellent job. The country has strong economics resources ! , worth of trillion of ringgit, where the money goes? by right this money must goes to the public not POCKETS! it is sad that the public is not aware of all the hidden agenda of govt, Today around 86% citizens earns below the average, a shame! WHAT needs another 55 years to soundle RAKYAT'S money !. The income gap is from hunders to hunderds of thousands of ringgit a month !, The public interest is taken away, the CRONIES & THEIR FAMILYS interest is taken in any decision. the NEEDS is basic term in economics for humans, well the WANTS is extra wish better luxurious life. In any Government objective the NEEDS & the Public Interest in policy in any final decision by govt, not govt interest which goes to small group of people! Public Interest, NEEDS, & issues & problems faced by public is important agenda to government, if THE PUBLIC INTEREST, WELFARE, NEEDS, ISSUES, & PROBLEMS CAN BE SETTLE, THAN I SAY IT IS " EXCELLENT JOB." AN EXCELLENT GOVERNMENT ON EARTH, RIGHT. Dear RAKYAT, news readers, read more foreign, International news, jounals, review to gain knowledge,on Economics, governments, new devolpments, compare with ours in order to improve. AN AVERAGE CITIZENS EXPECTATIONS OF GOVERNMENT !